Earlier this week, in advance of the grandly anticipated conclusion of “Battlestar Galactica” on Friday, the United Nations convened a panel to discuss the show’s treatment of terrorism, human rights abuses and religious conflict. Despite the obviousness of the public relations piggybacking, the United Nations occasion only further legitimized the political seriousness of a series that has explored the post-9/11 consciousness by examining the costs of wartime moral relativism. While a show like “Gossip Girl” might also be said to have ambitions — broadly, to address the injustices of class disparity, let’s say — it is unlikely that the name Blair Waldorf has ever come up at the coffee cart around which the Council of Economic Advisers gathers. 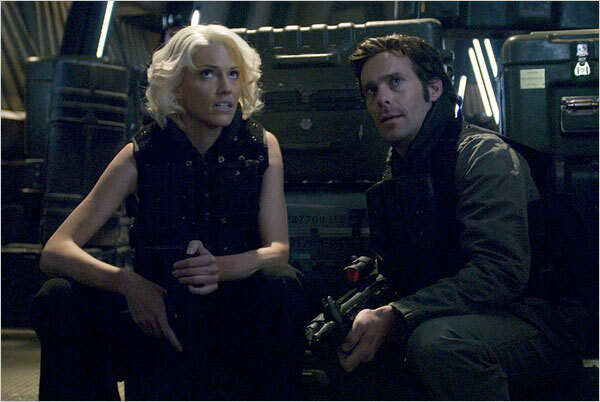 “Battlestar Galactica,” which during its four seasons has elevated the image of the otherwise campy and unambitious Sci Fi channel, has — like most science fiction — conducted an experiment in supposition. Ideas of faith, coexistence and democracy have been delivered with an air of intellectual rigor and a vagueness that has allowed the series to exist as a tabula rasa on which nearly any strain of speculative meaning might viably take shape. The series began with the premise that the human race had been extinguished by a robot tribe, the Cylons, it had created to enslave. The Cylons, who devoutly follow a single god, have been understood, quite reasonably, as stand-ins for the robotic, prescriptive aspects of religious extremism; they are Islamic fundamentalists in one view, the politically aggressive factions of the Christian right in another. They are literally born and born again. But toward the show’s finale, as the differences between the Cylons and the remaining humans began to dissolve, the opportunity for a more acutely contemporary symbolism emerged. It became easier to regard the series as an argument for the imperatives of shared interest in a post-racial world. At the same time, it would hardly seem illogical to read the series, right now at least, as a housing-crisis metaphor: thousands of displaced people without a safety net in search of a home. Since the revived “Battlestar Galactica” first made its appearance as a mini-series in 2003 it has been celebrated for its moral ambiguity, which seems empty praise, given how much bad television has been created in the name of a gray area and how little anything worthwhile is ever made without it. But the series has been far more remarkable for the ways in which its characters’ principles and value systems have evolved. Most notable has been the change in Gaius, whose self-regarding penchant for expedience finally gives way to a moving and incalculably consequential display of rectitude in the final episode. In the end, his self-serving rationalism comes to accommodate a genuine commitment to faith, one that seeks to resolve the show’s theological tensions, if not with the kind of pungence one might have hoped for. The humans have been worshiping multiple deities, but the longstanding battle between monotheism and polytheism is irrelevant, Gaius warns his adversary in philosophical summation. Atheism is the real enemy of mankind’s progress; salvation seems to lie in a vague belief in angels and higher powers, as if the series thought of itself as a promotional appendage of Alcoholics Anonymous. I’m not sure that in the most fleeting sense, it hasn’t. The final three hours of the series devote considerable time flashing back to the lives of the survivors before the fall, who are all shown drinking to the point of physical and psychological compromise. Though Laura Roslin (Mary McDonnell) seems able to imbibe with a semblance of moderation, we encounter her, in prehistory, learning that her father and two sisters have been killed by a drunken driver on the way home from a baby shower she has given. The scene poignantly contextualizes the calm that Roslin has demonstrated with a mesmerizing consistency throughout her tenure as president of the remaining colony of humans: her own world already evaporated a long time ago. Roslin’s relationship with the fleet’s military leader, Adama (Edward James Olmos), one built on respect and shared sorrows and a profound inclination to give care, has provided one of the sublime, bittersweet pleasures of the final season. There has been no better or quieter rendering of love in midlife on television. “Battlestar Galactica” has upheld certain liberal pieties without the utmost subtlety. (Why should we abstain from waging biological warfare on annihilators? Because then it makes us no better than our enemies.) But it has drawn the need for, and the sustenance of, emotional connection with a nuanced and deeply felt authenticity. UPDATED: That would seem to confirm findings that a search engine company shared with me on condition that I not reveal its name: The company spotted Web visits from an unannounced Apple product with a display somewhere between an iPhone and a MacBook. Is it the iPhone 3.0 or the NetMac 1.0? Like with the original iPhone—which was spotted online in web traffic blogs—I won’t be surprised if this was real. Other Apple computers were detected online first as well, although some of them—like multiprocessor Macs running SETI or other distributed computing tasks—were never released. Unlike Markoff, however, I believe that Steve was completely honest when he said “we don’t know how to build a sub-$500 computer that is not a piece of junk”, arguing that the company mission was to give more at the same price points, not less features for less money. So out of pure instinct, I think we can rule out a MacBook nano netbook. Instead, if this is indeed a new unannounced Apple product, here in Gizmodo we are thinking about an iPhone HD with an updated 800 x 480 pixel display, probably coming in 2009. That resolution is something between the iPhone’s 480 x 320 pixels and MacBook’s 1280 x 800 pixels, which is completely reasonable: Other phones—like the HTC Touch HD—already have these ultra-sharp screens. Update: Some people argue that it may be a hackintoshed netbook, a computer running a modified version of Mac OS X. This may be the case, but I’m sure the “unnamed search company”—which won’t say the name of the Apple device—has plenty of hackintosh netbooks in their logs. On top of that, all hackintosh computers identify themselves as a Mac Pro, independently of their hardware. Britain’s Minister of Science Lord Drayson is announcing today the commencement of the Bloodhound rocket car project, which will propel current land speed record-holder and RAF Pilot Andy Green to speed of over 1000mph. This is another step in the sporadically intense fight for the fastest car in the world, but the Minister has a half-hilarious, half-reasonable excuse for it: it’ll get British students interested in taking advanced science classes. Nobody really cares about stuff like that because, well, 1000mph. The first part of the run will be propelled by a jet engine, originally designed for the Eurofighter. After the Bloodhound reached 300mph, propulsion duties will be taken over by an experimental “bespoke” hybrid rocket, during which time the driver will be subjected to 2.5Gs of acceleration force until he hits 1050 mph. The whole process will take about 40 seconds, amazingly. Naturally, possible blackouts, horrific crashes and mechanical malfunctions are all in the cards here. Dont’ worry though — according to the Times, he is preparing in the most ludicrous way possible: “He will practice… in a stunt aircraft, flying upside-down over the British countryside.” No date for the run has been set, but we should get a few more details after the Minister Drayson’s formal announcement today. You might hate your alarm clock, waking you up as it does every morning, but think about it from your alarm clock’s perspective. You sleep through its alarms, and when you do deign to wake up when it goes off, you just hit the snooze button and go back to sleep. As your selected wake-up time approaches to within five minutes, its feet and body will begin to glow, and when the alarm sounds, it begins tapping its arms lightly, but if you are dilatory in touching its snooze sensor by more than one minute, it launches into its full tantrum routine and turns off after an hour of unabated whining. Maybe giving your alarm clock human characteristics isn’t such a great idea after all. Do You Fear Monthly Internet Service Limits? Comcast dropped the bomb the other day that it’ll be placing caps on Internet service — 250 GB per month. When a customer goes over, they’ll be contacted by Comcast and asked to curb their usage, and there’s also a possibility that the company will charge $15 for every 10 GB over the limit. Considering Comcast is the country’s second-biggest Internet provider, this should affect tons of people (yours truly included), and in general, I’m wary of new limits on services. On the other hand, 250 GB is a whole lot of uploadin’ and downloadin’; SFGate reports that the average user only utilizes about two or three GB per month. Of course, setting a limit now could set a precedent and usher in eventual lowered limits. What do you think — are you bummed that Comcast is capping usage, or does it not make a difference to you? OMG – I so want one! Remember your first hamster? I do—his name was bullet. He died, but that’s a different story. He had this amazing modular hamster cage that allowed him to go all over the place for fun and entertainment. Now Octopus Studios, a furniture and aquarium design firm is offering up similar type of modular designs, but for fish with the Silverfish Aquarium. The entire kit is custom build to order by Octopus Studios. It comes with extensive instructions for installation, or you can pay even more to get Octopus Studios to install it for you. The fish tank is designed for fresh-water fish and would make a great training gym for beta fish. Train fish in each individual module and then let them go at it in a center ring. I’d pay to watch that.